An online retailer has listed the Acer Cloud Mobile release date as September 5, which means we could finally see the Ice Cream Sandwich handset in three weeks time. We reported yesterday that the Acer Liquid Glow was now on sale and that the Cloud Mobile was about to launch in the UK, with September mused as its arrival. Now online retailer Expansys has revealed on its site that it expects stock of the Acer Cloud Mobile on September 5 – although it seems this date isn't set in stone quite yet. We contacted Expansys and a spokesperson told us: "this is the latest information from Acer regarding the handset, and we hope to speak to Acer again today about it." The Cloud Mobile is currently available for pre-order on the site, priced at £284.99 SIM-free, which will get you a 1.5GHz dual-core processor, 1GB of RAM, 16GB internal storage, 4.3-inch 720p display, 8MP camera and Android 4.0. 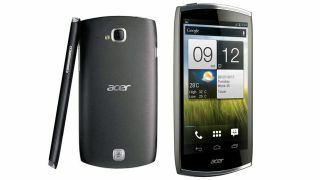 We have also contacted Acer about the Cloud Mobile and we'll update this article once we hear back.